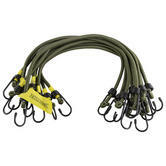 Variation 1 Choose Variation 1 8mm x 12"8mm x 18"8mm x 24"8mm x 30"
The heavy duty olive bungee cords are individually Nitehawk branded. The 8mm shock cord make these ultra strong and making them ideal for all kinds of outdoor pursuits, luggage ties, car/bike straps and more. 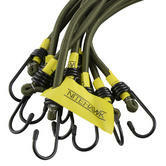 The bungee cords can be used in all weathers and are also available in 4 sizes - 12", 18”, 24" & 30”.